are the elite shock troops of the Galactic Empire. Able to strike with speed and accuracy, they are mercilessly deployed to quell insurrections and maintain Palpatine's New Order. Encased in fearsome white armored spacesuits over black body gloves, these faceless warriors fight without concern for their own safety, are incorruptible and highly disciplined. 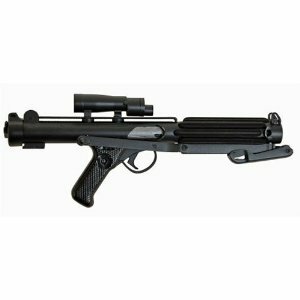 Representing the most visible symbol of Imperial might, Stormtroopers are armed with the most powerful of personal weapons, the Blast Tech E-11 blaster rifle, and serve in both ground forces and the Imperial starfleet. Replica measures 8" x 4" x 5".